WINDU Matoka was at Canisius Secondary School from 1980 to 1984 before going to the Copperbelt University (CBU) to pursue a bachelor’s degree in Business Administration.Mr Matoka, who also does part-time lecturing in economic management policy at the University of Zambia, went on to pursue a master’s degree in Business Administration at the Management College of Southern Africa. He just completed pursuing a Doctor of Philosophy in Business Administration in Malaysia at the Binary University of Management and Entrepreneurship in partnership with the University of Zambia (UNZA). In addition, he offers consultancy services to small and medium business enterprises on a Zambia National Broadcasting Corporation (ZNBC) programme dubbed “Business Enterprise”. Mr Matoka, who also worked at the Zambia Development Agency (ZDA) as SME business director from 2007 to 2013, attributes his achievements to a good foundation laid during his time at Canisius Secondary School. “I owe everything I am today to the teachings and guidance that I got from Canisius Secondary School. I want to give back whatever I have learnt to the current pupils so that they can also become successful,” he says. Last Friday, he was part of the Canisius Secondary School Alumni Association that went to Monze for a careers fair at their alma mater. The association, or The Canisian, as it is called, identified a number of professionals within the network to give career guidance talks to pupils at the school. The speakers presented over 10 different career opportunities to about 200 pupils, mainly those in Grade 12. This half-day event provided pupils with an opportunity to explore careers of interest by being exposed to and speaking with individuals working in different fields. “The ease of getting government jobs such as in education, health, army and the police service, is tempting enough to discourage young pupils from searching for other career opportunities,” says association secretary Matongo Maumbi, who left the school in 1998 and has forged a career as a broadcast journalist. “In an attempt to deal with this problem, The Canisian thought of exposing the pupils to various career paths they can take up after school. Mr Maumbi, who has worked for Radio Chikuni and is currently with the BBC Media Action (formerly the BBC World Service Trust), says the careers talk is an opportunity to interact, first-hand, with other Canisians that are actually practising. He says Careers Day also helps enlighten pupils on the importance of subject combination when choosing a career. It also helps them to prepare what to expect in a given career. “We want to broaden their scope to understand that if they cannot go into sciences, they can go into arts or business,” Mr Matoka says. Dennis Sikaulu, who was at Canisius from 1992 to 1996, believes Careers Day is very important to the pupils because it gives them guidance on various career choices. Mr Sikaulu, an economist by profession and a small and medium enterprises (SME) specialist under the ZDA, appreciated that Careers Day links pupils to the people in the industry or job market. “Young people need to put a lot of things into consideration when choosing a career path. They need to know their strengths, their weaknesses and their hobbies to make the right choice,” he says. Mr Sikaulu believes that young people find it difficult to choose the right career because of lack of information. He says Careers Day equips pupils with adequate information on how they can choose the right career. “We as the former pupils did not get adequate career guidance because we never had Careers Day. We came up with Careers Day to help pupils make the right career choices,” Mr Sikaulu says. Moonga Hamukale, who was at Canisius from 1997 to 2001 and is now a chartered accountant working for PricewaterhouseCoopers (PwC), says it is difficult for most young people to pick right career choices because there is no practical engagement with people from the industry. “The key issue is to identify what qualifications one needs to execute different job options which are available on the job market. One of the key messages we want to bring out in the pupils is good character,” Mr Hamukale says. 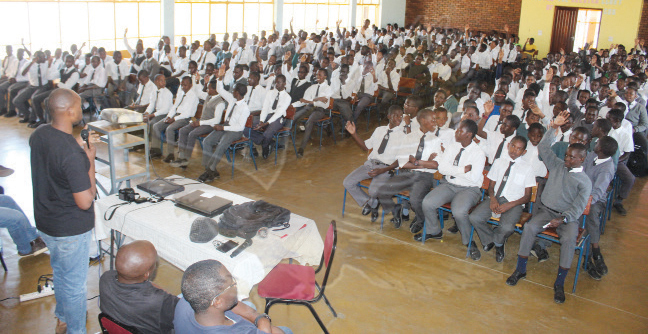 Bernard Moonga, who was at Canisius from 1990 to 1993, says most young people are limited to traditional careers like teaching, military or being a medical doctor or pilot because they are not exposed to other careers. “It is crucial for us to give the pupils insights on how the world is evolving and how it is becoming more competitive to get a job out there. We also want to inspire them to become whoever they want to,” Mr Moonga, who is a lecturer in the Department of Food Science and Nutrition at UNZA, says. The Careers Day was broadly welcomed. Brey Sichoonga, who was at the school from 1990 to 1994 and has been a teacher at Canisius from 2001, says Careers Day opened up the minds of the pupils with regard to choosing the right career. Canisius School head teacher Lufungulo Mwanachingwala commended the alumni for the initiative. “Careers Day is necessary because it gives the pupils first-hand information on the available career choices,” Mr Mwanachingwala said. Joseph Kuyaba, who is in Grade 10, says Careers Day should continue so that it helps pupils who are not sure of what career to pursue to make the right decision. “Careers Day is quite inspiring and overwhelming because it exposes one to various careers available on the job market. It should be embraced so that other pupils find it easy to make a career choice,” he says.